Contact lenses are thin lens placed on the direct surface of the eye. They can be used for cosmetic or vision correction. Contact lenses have many advantages over spectacles. Contact lenses move with the eyes, allowing a natural view with no vision obstruction. Unlike glasses, they do not get splattered by dust or fog up. Contact lenses are the best options for sports and other water activities. The global contact lenses market has been segmented on the basis of product type, design type, wear type, distribution channel, and region. Based on product type, the market is segmented into soft lenses and gas permeable lenses. Soft lenses are further sub segmented as daily wear, and extended wear. As compared to gas permeable, soft lenses are more widely used globally. Based on design type, the contact lenses market is classified into spherical, toric, multifocal, and others. The spherical segment held major share in the global contact lenses market. In toric contact lenses, the lenses rely on gravity to rotate to the right angle in order to correct the warp in the cornea. In terms of wear type, the contact lenses market is segmented into disposable and reusable. Reusable segment accounted for major share in 2017. However the disposable segment is anticipated to expand in future as these are easy to use and maintenance free. Based on distribution channel, the contact lenses market has been segmented into online and offline. Online can be further sub segmented as e-commerce and company owned portal. Offline segment can be divided into exclusive stores and multi-brand stores. Multi-brand stores segment is anticipated to grow during the forecast period. Offline has the major share across the globe; however the online segment is expanding steadily over time. The North America contact lenses market is mainly driven by factors such as aging population, rising prevalence of myopia etc. The U.S. dominates the contact lenses market. Although North America forms the major chunk of the contact lenses market, demand for contact lenses in Asia Pacific is expected to increase globally during the forecast period. Companies are expanding their portfolio by introducing advanced techniques to make contact lenses more comfortable for use. The contact lenses market is consolidated due to the dominance of few strong players such as Bausch & Lomb Incorporated, Alcon (Division of Novartis AG), Johnson & Johnson Vision Care, Inc., CooperVision, Inc., ZEISS International, SEED Co. Ltd, Hoya Vision Care Company, Essilor, Menicon Co. Ltd, and BenQ Materials Corporation which are the key companies profiled in the research report. The report also offers competitive landscape of key players in the contact lenses market. The contact lenses market report provides analysis for the period 2016–2027, wherein the period from 2019 to 2027 is the forecast period and 2017 is the base year. 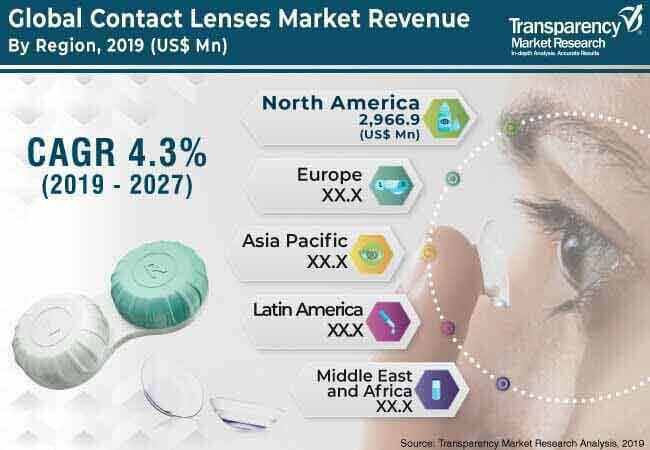 The report covers all the major trends and key drivers playing a major role in the growth of the contact lenses market over the forecast period. It also highlights the drivers, restraints, and opportunities expected to influence the market during the said period. The study provides a holistic perspective of the contact lenses market throughout the above mentioned forecast period in terms of revenue (in US$ Mn), and volume (in Thousand Units), across different geographies, including Asia Pacific, South America, North America, Europe, and Middle East & Africa (MEA). The key factor that is exerting significant impact and driving the global contact lenses market is increasing aging population and increasing prevalence of myopia. Soft contact lenses are trending as they are flexible with high water content making them comfortable to use. Daily wear contact lenses can be used up to 18 hours continuously. Spherical design contact lenses have major share as they are affordable when compared to toric and multifocal lenses. Disposable contact lenses have high demand as they need not be cleaned after removal as they are mostly disposed after use. The global contact lenses market has been segmented on the basis of product type, design type, wear type, distribution channel, and region. Based on product type, the market is segmented into soft lenses and gas permeable lenses. Based on design type, the contact lenses market is segmented as spherical, multifocal, toric, and others. Based on wear type the market is segmented as reusable and disposable. Based on distribution channel, the contact lenses market is segmented as online and offline. Online is further sub segmented into e-commerce portal, and company owned portal. Offline can be further sub segmented as exclusive stores and multi-brand stores. In terms of country, the North America market is divided into the U.S., Canada, and Rest of North America. Similarly, the Europe market is divided into U.K., Germany, France, Italy, and Rest of Europe. Asia Pacific has been segmented into China, India, Japan, and Rest of Asia Pacific. Middle East & Africa covers the G.C.C., South Africa, and Rest of Middle East & Africa. Similarly, the South America region includes Brazil, and Rest of South America. This report provides all the essential information required to understand the contact lenses market and its types. The report includes key developments in the contact lenses market. Porter’s Five Force analysis, which identifies bargaining power of suppliers, bargaining power of buyers, threat from new entrants, threat from substitutes, and degree of competition in the contact lenses market is also included in the report. Value chain analysis which shows work flow in the contact lenses market and identifies raw material suppliers, service providers, and distribution channels of the industry is covered. Segment trends and regional trends have been highlighted. It also covers segment-wise incremental opportunity analysis and price trend analysis (retail price).Furthermore, the report covers incremental opportunity analysis and identifies and compares attractiveness of segments on the basis of CAGR and market share index across North America, Europe, Asia Pacific, Middle East & Africa, and South America. The same has also been provided for each segmentation category i.e. product type, design type, wear type, distribution channel, and region in the scope of the study. The report covers market structure analysis region-wise and country wise for the market. The report also includes competition landscape, which includes competition matrix, market structure analysis of major players in the global contact lenses market based on their 2017 revenues, and profiles of major players. The competition matrix benchmarks leading players on the basis of their capabilities and potential to grow. Factors including market position and offerings have been considered while presenting competition matrix. This section also identifies and includes various recent developments carried out by leading players in the contact lenses market. Bausch & Lomb Incorporated, Alcon (Division of Novartis AG), Johnson & Johnson Vision Care, Inc., CooperVision, Inc., ZEISS International, SEED Co. Ltd, Hoya Vision Care Company, Essilor, Menicon Co. Ltd, and BenQ Materials Corporation are the key companies profiled in the research report. The report also offers competitive landscape of key players in the contact lenses market. Details such as financials, business strategies, recent developments, and other such strategic information pertaining to these players have been duly provided as part of company profiling.